This place is unlike the touristy hangouts of Chinatown and Little India. Katong/Joo Chiat operates like a town, with a good mix of commercial and residential areas, and close proximity to a range of places of worship, old-school shops, and not forgetting, plenty of food options! Let me tell you a little about the history of the place. Katong refers to a species of sea turtle that is no longer found in Singapore, and Joo Chiat is the name of a wealthy plantation owner who used to own plots of land and coconut plantations here. In the 1930s, many communities moved eastward out of the city centre and this area was an idyllic seaside retreat for the wealthy. There were beautiful bungalows and shophouses, and it was a melting pot for Eurasians, Straits-born Chinese (or Peranakans), Malay, Indian and Chinese. This entrepreneurial grandmother of the current owners started selling Nonya rice dumplings under a Banyan tree just next to this shop in 1945. 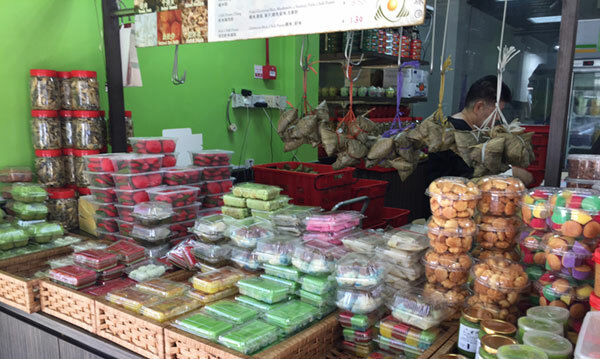 Their dumplings are to die for and they now sell a repertoire of local cakes, coconut jams, sambals, pre-mixes and local cookies. Kim Choo has another outlet on East Coast Road, but you want to come to this outlet as you can peek inside glass doors to see the little factory where they churn out the goodies daily. After you have cleaned out their shelves, you can conveniently walk across the street to an unassuming coffee shop called Dong Cheng Eatery where there are two “oldie” hawkers selling Char Kway Teow and Prawn Mee Soup. Of course, you can try both dishes at one time! Just bring a friend and do a half/half! These two rows of conserved colourful houses with ornate details like floral and animal tiles, “bat” windows and mystical lions standing guard at the gates are examples of a great mix of East and West cultures. The colours remind me of San Francisco’s Postcard Row. I would think the owners of these residences are used to tourists and locals milling outside for photos. Again, I wish my grandparents bought one. The last I heard, one of these terraces will set you back S$6 million! Hawker centres are plenty in Singapore, but when you have three famous stalls in one, you know you have arrived at the “Mother of All Hawker Centres”! Be prepared to test your patience with long queues. If I come all the way here, I would want to eat it all. Diets can wait. Joo Chiat Ah Huat Wonton Noodle, #01-04 – The stall has a clinic-style electronic number sign so you know the food should be good! Say Seng Tau Kwa Pau, #01-05 – This stall started way back in 1959 and they sell this huge Fried Bean Curd, sliced in the middle, and stuffed with diced cucumbers, braised egg, fried yam, coriander leaves and smeared with braised duck rice gravy (as they sell duck rice too). There is also a sweet and spicy chilli dip if you want to spice it up, but I always love the food as it is, without the spice, so you can taste the “real” flavour and not “insult” the chef (like my catering school teacher used to say). Lau Hong Ser Rojak, #02-14 – Rojak is a local mix salad made from a combination of cut cucumbers, fresh juicy pineapples, raw turnip, beansprouts, You Char Kway (deep-fried dough sticks), Tau Pok (fried beancurd), torch ginger, sugar and tossed with dark prawn paste (the paste here is specially imported from Penang). No chilli paste for me, thank you. There are more places to explore but I can’t go on as the more I write, the hungrier I get! Above article written by The Witty Guide first appeared in NOSHtrekker's newsletter on 30th June 2017 and reproduced with kind permission of NOSHtrekker. NOSHtrekker is an amazing and exciting company which provides in-home curated dining & culinary experiences, which can be incorporated into our tours!